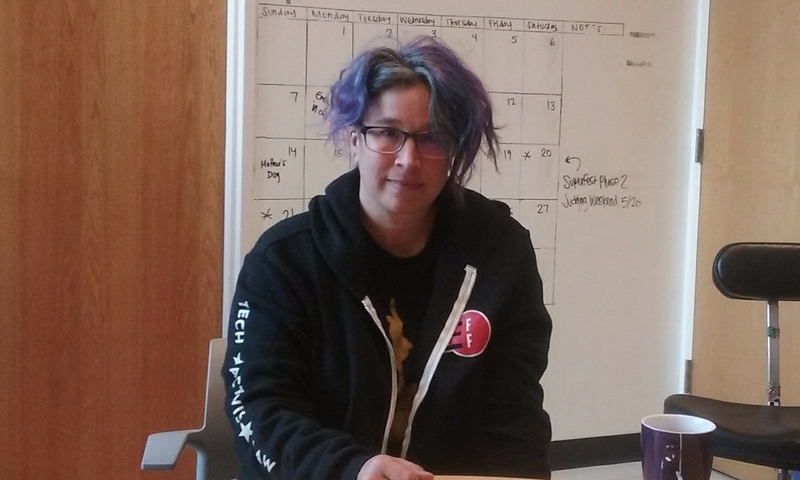 Liz is currently the release manager for Mozilla, and has worked in two eras of tech: the 1990s and the mid-2000s to the present. She learned her computer skills from tinkering with computers from a young age, and having the freedom to experiment. In addition to her work in open source software, Liz is a blogger, writer and translator, and is involved in hackerspace projects. Liz deals with mobility impairments, and chronic pain from those impairments, that have a significant effect on how she can work. The structure of Liz’s work at Mozilla has many benefits for her because of her mobility impairments. Instead of working on a traditional hourly schedule, she has longer timeframes, like six weeks to work on a project. This means that even if she is not productive over a specific hour or even a day, she is very productive over the course of those six weeks. In addition to this, Liz often works remotely with a distributed team who are in many different time zones around the world. It is not important that everyone be working at the same time. It’s more important that communication is strong, persistent, and frequent. If she has a flare-up and is unable to leave the house she still has the possibility of getting work done. She often thinks, as she is working from bed, that this job is perfect for people with mobility issues. In addition, the fact that her physical condition can change at a moment’s notice means that she is very good at contingency planning. And since software release, as she describes it, can be “a constant disaster,” this skill is very helpful in her workplace. In her opinion, anyone with a disability who has managed their own healthcare competently, with all the medical, insurance, and government bureaucracies, has many skills needed in software project management - tracking a complex process and coordinating work across several teams. Liz’s relationship with her work in tech has changed over the course of her time working in it. In the ‘90s she was much more uncertain about how people would treat her and her disability. She would often fake being able-bodied for a job interview, scoping out the location days beforehand to see how she could get through it with minimal signs of having a disability, minimizing walking distance. Then when on the job, she would openly use her mobility aids such as cane, crutches, or wheelchair. She worried that if possible employers saw her disability first, they would think she was too unreliable or would be out on sick leave too often. Liz describes this period as, “struggling to be as badass as possible; to be super tough and independent and hide any difficulties. And then I would have that moment where I would go oh no, I am going out on medical leave.” Interestingly, she often got more rude (and illegal) assumptions and questions about her gender, like whether she would get pregnant, than about her disability in this period. In contrast, Liz has found that now things are more open around disability, although there are still some issues. In general, Liz finds that the places she works at now are more welcoming and upfront about their healthcare policies. She also is more upfront about her needs, partially because she has openly blogged about it, so people are more likely to have come across the information. She also relies on her wheelchair or scooter for mobility, which you can’t exactly hide. She finds that her team often acknowledges the need for skills like contingency planning as well nowadays. Despite this general atmosphere of acceptance, Liz often finds herself the only visibly disabled person or wheelchair user at work. Even at the yearly Mozilla conference, which brings together around 1000 people from the company, she has been the only wheelchair user for many years. Liz has also found that companies and event organizers could improve their work around accessibility. Like many disabled people, being an unpaid disability consultant (and general diversity since she is also a woman) is, “my extra job, right?” She feels particularly strongly about event accessibility. Many times, a conference will claim they are accessible when they don’t have the structure to make the supposedly accessible spaces as easily usable as the non-accessible parts for able-bodied people. Some examples include having to hunt down the manager with the keys to the freight elevator and the time when Liz had to crawl on stage to give a talk. On this she says, “OK, I have to crawl on stage in front of two thousand people…I can do it, and I did do it, but it was not the frame of mind I wanted to be in, i.e. fury…when I’m on stage giving a talk.” Liz is much more convinced by an event’s or company’s effort when they have detailed accessibility information that is easy to find by default. Many times, while waiting for a freight elevator or hotel lift to be unlocked, the people Liz are waiting with are mothers with double-wide strollers or an elderly person with a cane. She is also frequently approached by people asking for advice on mobility aids, or even where the nursing room is, because her mobility aids mean she is in a marked state. Because of this, Liz feels it is important to seek solidarity with unexpected groups who can also benefit from disability accommodations. Although it can feel devaluing, as if disabled people aren’t truly the important ones, it is ultimately helpful in getting everyone the services they need. She is honored when people ask her questions like the ones above, because it tells her that those people recognize that solidarity. Unfortunately, Liz’s marked state doesn’t always produce positive reactions. Since her physical condition changes, she doesn’t fit the common stereotype of the paralyzed wheelchair user. Thus, she will get rude comments like, “what’s your deal, I saw your legs move!” One particularly egregious example of this is when a woman in HR gave her and a chronically ill coworker a “heartfelt speech” about how she would kill herself if she had a disability, since she wouldn’t want to be a burden on her family. When Liz asked if she should kill herself, since she had similar problems, the woman replied that Liz shouldn’t because she has great upper arm strength. Liz says, “And I was like, oh is that the barrier? If I don’t have upper arm strength I should just off myself?” However, Liz has also had significant positive experiences because of her marked state. When Noisebridge, a hackerspace Liz is involved in, was moving spaces she brought up that they should keep wheelchair accessibility in mind. They did, and to this day maintain that accessibility in multiple ways. She says that despite her visibly being around, they probably would not have considered accessibility if she had not mentioned it. Other wheelchair users have benefitted from the constant attention to accessibility at Bay Area hackerspaces like Noisebridge, Sudo Room, and Double Union. Liz has always been attracted to hackerspaces and open source software for the ideals of the movement. In theory, it is open to anyone, although in practice the same oppressive dynamics as elsewhere can apply. She believes that people and companies who force customers into exclusive, expensive deals are “super evil” whether they are a tech company or a wheelchair manufacturer. Liz thinks Wikipedia, the Internet Archive, Mozilla, and similar organizations are “awesome”, and says that although they can be anarchic and chaotic, the rules for helping exist, “you just have to figure out which part of it you care about.” She also says that in that chaos, “there’s always something to be done.” Volunteering for open source projects can be a good way for people with disabilities to test the waters of the industry, and is a great pathway to get hired.